Why Did St. Francis Succeed? — Who are the Secular Franciscans? Who are the Secular Franciscans? Why Did St. Francis Succeed? Sr. Margaret Carney is a member of the Sisters of St. Francis of the Neumann Communities. 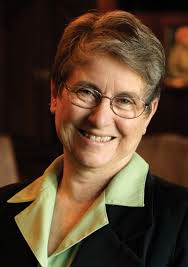 She is President Emerita of St. Bonaventure University and has lectured widely on Franciscan history and spirituality. Her own research concentrates on early Franciscan lay penitents and Franciscan women. She has served in various positions within the Franciscan academic world and also seeks opportunities to open the riches of Franciscan legacy with today's seekers after a life of spiritual depth and social concern. Interested? You may meet us at the Library for the lecture, or join us before for a light brunch at Vin et Fleurs, 69 Thompson Street at 11:30 a.m. You can browse the menu at vinetfleurs.com.